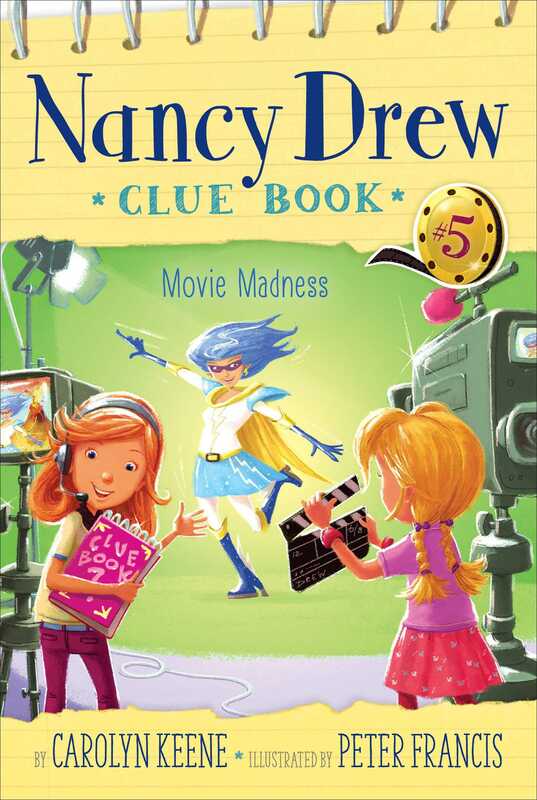 Help Nancy and her friends find a prop that’s gone missing from a superhero movie set in the fifth book in an interactive Nancy Drew chapter book mystery series. Grab a piece of paper and get ready to jot down your own ideas and solutions to the case! School is out for summer and the timing is great because a movie is filming in River Heights, and Nancy, Bess, and George—along with a bunch of their classmates—get to be extras in a scene shot at the playground! The movie features Glam Girl, a fashion-forward superhero who gets her powers through her clothes. When the girls arrive on set, they catch a glimpse of the super shoes that give Glam Girl the ability to run, jump, and kick with super-speed. An assistant explains to them that there is only one pair in existence and that they were custom-made for the actress Shasta’s feet. Everyone goes wild as Glam Girl runs into the playground, blue shoes glimmering. But when Shasta’s on a between-scenes break, the shoes go missing! The director says that if the shoes aren’t found, they’ll be leaving River Heights and their scene won’t make it into the movie! Good thing Nancy happens to have her most important prop right in her pocket—her clue book. Who took the blue super shoes? Was it Paloma Garva, who needs a pair of blue shoes for her Junior Fashion Show? Was it Rosie the stunt-woman, who seems to envy Shasta’s spotlight? Or was it the Popcorn Peeps, their classmates’ film club, who need movie relics for their new museum? “How lucky are we to be living in Hollywood, you guys?” eight-year-old Bess Marvin asked excitedly. Nancy Drew and George Fayne stopped walking to stare at Bess. Did she just say . . . Hollywood? “Huge difference!” George pointed out. “I guess!” Nancy said with a smile. All three best friends had reason to smile: Summer vacation had just begun. Even better, a scene in the next Glam Girl action-adventure movie would be filmed right in their own neighborhood at Turtle Shell Playground! “I still can’t believe they’re using kids from the neighborhood as movie extras!” Nancy said as they headed for the playground. “Sure, if you’re a Smurf!” George snorted. “River Heights and Hollywood!” George finished. Bess was a serious fashionista with a room full of clothes and accessories. The only fashion accessory George dreamed of was a smartwatch! “A real-live museum?” Bess asked. “What’s in it so far?” Nancy wanted to know. “And gross grease stains, too, I’m sure,” Bess cut in. “Maybe you can get something from Shasta Sienna on the Glam Girl set today,” Nancy suggested. “Maybe she’ll spit out her gum!” George joked. “I know that,” Sidney said. “Good luck with your museum, Sidney,” Bess said with a little wave good-bye. Sidney nodded thanks, but as the girls walked away, he seemed deep in thought. “Maybe he’ll take your advice about getting something from Shasta, Nancy,” George said. “Something less gross!” Bess added with a frown. When the girls reached Turtle Shell Playground, they couldn’t believe their eyes. Their favorite swings, slides, and monkey bars were surrounded by movie cameras and trailers. Microphones called “boom mikes” were attached to long poles that were carried by staff wearing headsets. Other crew members also wearing headsets and Glam Girl T-shirts scurried about busily. “Are you sure this is our playground?” Nancy gasped with surprise. A woman with a smile walked over. The name on her ID tag read KEISHA ELLIOT. Nancy turned to see more kids lined up at the table. They looked just as excited as she was! “My sneakers do that.” George sighed. “George, be nice!” Bess hissed. The girls hurried to the table. They stood behind a girl with long curly hair. Nancy recognized the girl as Paloma Garva from the fourth grade at school. Paloma’s hair was perfectly brushed and styled. Her yellow sandals perfectly matched her sundress, and her toenails were perfectly polished. That’s because Paloma was the school perfectionist—and proud of it! “I guess you want to be a movie extra too, huh, Paloma?” George asked. “If you’re Glam Girl’s sister, you might have to dye your hair blue!” Bess pointed out. “I heard about that store,” Nancy said. “We know,” Bess said with a sigh as she frowned at her cousin’s sweatpants and T-shirt. “What will you be modeling, Paloma?” Nancy asked. “Is it Glam Girl?” Nancy asked as she turned to see where Bess was pointing. Nancy, Bess, and Paloma raced toward a young man carrying a pair of boots on a silver tray. George groaned as she lagged behind. Nancy brushed aside her reddish-blond bangs to see the boots. They were blue boots with a strip of shiny yellow fabric at the tops. “So pretty!” Nancy swooned. But just as she pointed to the boots, Matt pulled the tray back. Nancy gasped as Paloma grabbed Glam Girl’s boots off the tray. What was Paloma doing?